Keeping this in mind it becomes a great starting point for you to structure your magic tricks into magic routines. You’ll see we have done this in today’s magic lesson. In Magic Lesson 2 – Change Bag Magic Prop we can start discovering what a magic prop is and why magicians love them. The magic change bag pro is classified as a magic utility prop. A magic utility prop is any prop that you can use in multiple routines. Why is this desirable? Wouldn’t the audience get bored if you used the same magic props over and over again? Good questions for inquisitive magicians. 3. You already know the magic moves and techniques so you don’t have to learn a new magic trick. This really helps with growing your confidence. What are some examples of magic props? In this video the paper bag trick is simply a home made version of the magic change bag. 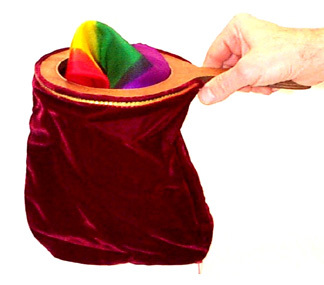 You will find a change bag magic prop in the magic case of almost every children’s and family magician. 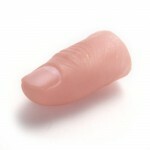 A thumb tip is brilliant because you can quite literally do hundreds of effects with this one small magic trick prop that comfortably fits in your pocket. Be sure to add this must have magic prop to your magic bag. 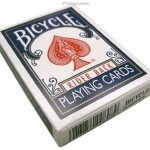 Other than the change bag magic prop, let’s not forget the pack of playing cards. Think of the thousands of magic tricks you can perform with just a deck of cards. I guess this makes it the ultimate utility prop for magicians. The pack of playing cards that Julian and Ken use every week is their favourite utility prop. Just by changing the order of the cards a little you can do dozens of funny magic tricks with big WOW moments. Another lesson from today’s magic trick is the value of giving something to your audience to take away from their magical experience with you. Take it from Ken and Julian and almost every other professional magician IN THE WORLD that doing this simple thing has more power to affect your audience than the hardest sleight of hand magic moves you will ever learn. In upcoming Magic Lessons of the Week we will talk about this in more detail. Stay tuned for more great magic lessons from Julian and Ken. Did you enjoy this Change Bag Magic Utility Prop? To learn more simple magic tricks Click here!